A few months ago, thanks to all of your amazing support, I won the IACP People’s Choice Award for best culinary website. It was such an honor to be recognized, I’m still glowing and farklempt and generally thrilled by it all. 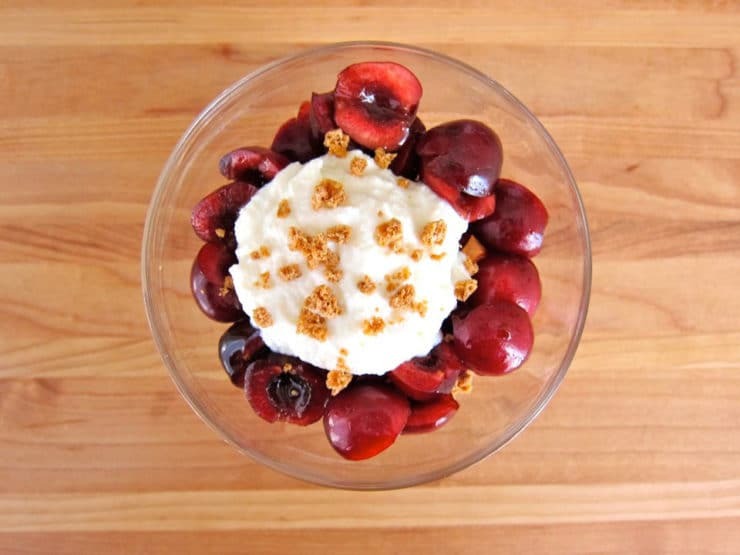 There was also a judge’s choice winner in this category– Cheryl Sternman Rule’s food blog, 5 Second Rule. I’ve admired Cheryl’s blog for some time, and was thrilled when I discovered that we had both won IACP awards. We connected online, then met in person last month at BlogHer Food in Seattle, where we were both speakers. Cheryl sent me a copy of her new cookbook, Ripe, and I am officially in love. What a feast for the eyes and senses! Ripe is all about fruits and vegetables, a meat-free cookbook that allows seasonal produce to shine with simple, creative preparations. The book is drenched in color– it’s a joy to flip through and gaze at the gorgeous photography. When I met Paulette Phlipot, the book’s photographer, she told me that the book has tapped into an unexpected audience– young children. “They are really drawn to the colors,” she told me. In fact, the book is uniquely arranged by color, divided into the categories of red, orange, yellow, green, purple, blue and white. Cheryl’s love for seasonal cooking comes through in her writing. 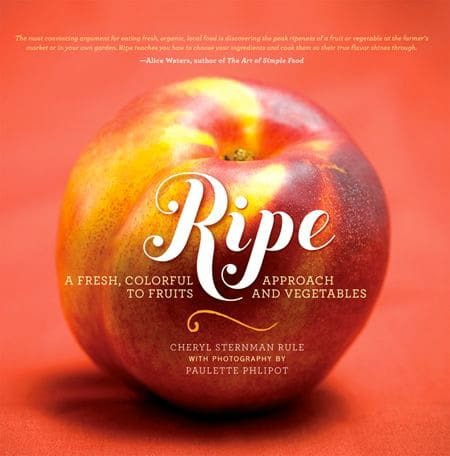 Ripe celebrates fresh fruits and vegetables with an artistic edge… this book is, in a word, luscious. 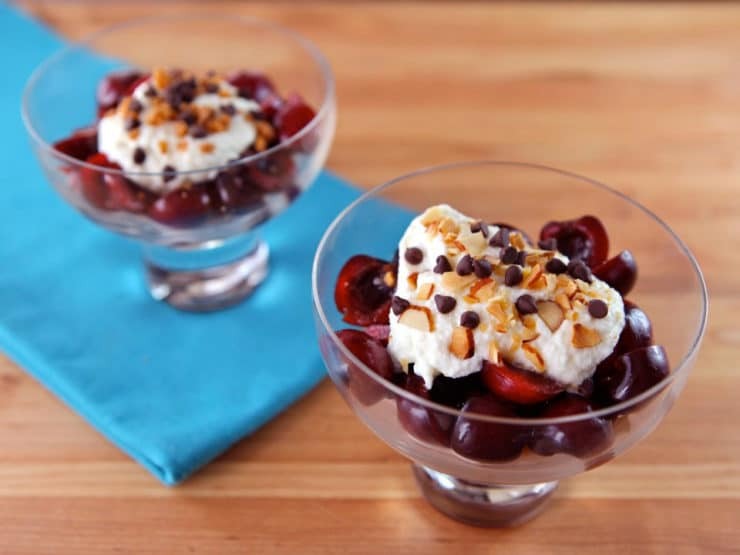 This preparation for “Smashed Cherries, Amaretti, and Ricotta” is characteristically simple, like all of the recipes in the book, allowing the natural sweetness of the cherries to take center stage. The thing I love about Ripe is how adaptable the recipes are… they are like springboards for the imagination. I love this recipe as written in the book. For this blog post, I adapted the recipe with a couple of small changes. Because it’s summer and I’m feeling naughty, I tossed the cherries in amaretto before pouring them into the serving bowls (totally optional– the cherries are fabulous on their own without liqueur). I also increased the amount of chocolate slightly because I’m a chocoholic. I recommend using a good quality dark chocolate if you have it on hand; also, make sure your cherries are perfectly ripe and sweet. The original recipe is made with smashed amaretti cookies, which are Italian almond-scented cookies. They give a terrific crunch and flavor. If you can’t find amaretti or want to make the dish gluten free, Cheryl offers a substitution of chopped toasted almonds. I made it both ways, and in my humble opinion they are both equally delicious. I don’t often talk about cookbooks on my blog, but Ripe is something truly special that I wanted to share with you all. It would make a terrific gift for somebody who loves healthy eating, vegetarian cooking, seasonal produce, or colorful food photography. I hope you get a chance to check it out! By the way, if you’re in the Southern California area, Cheryl has a book signing event in Orange County on July 21, 2012 called A Ripe Evening at the Rustic Garden Bistro. The dinner part of the evening is sold out, but the cocktail and dessert potluck still has availability – click here for more information. 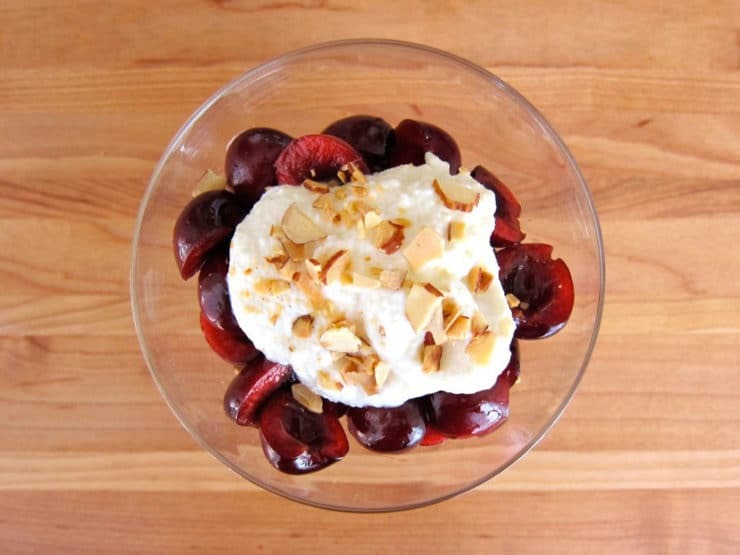 Smashed Cherries, Amaretti, and Ricotta - fresh, healthy dessert recipe from my friend Cheryl Sternman Rule's cookbook, Ripe. 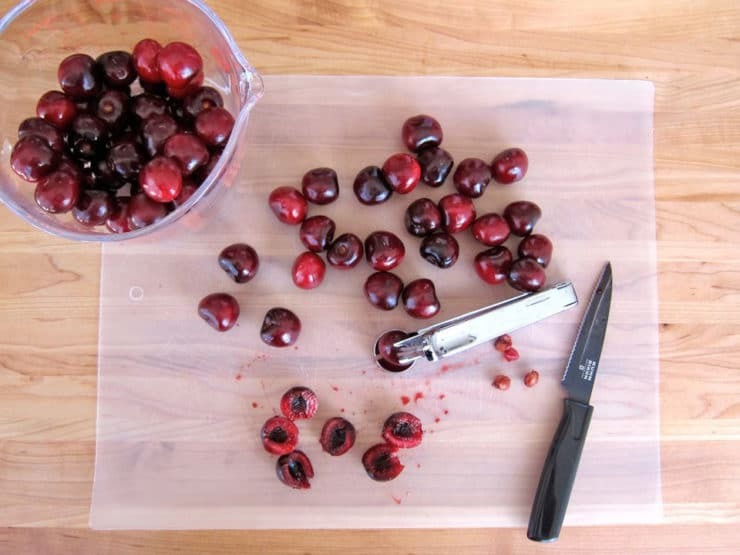 Whack the cherries with the flat side of a knife till they flatten, then discard the pits - or, pit the cherries using a pitting tool and slice them in half. 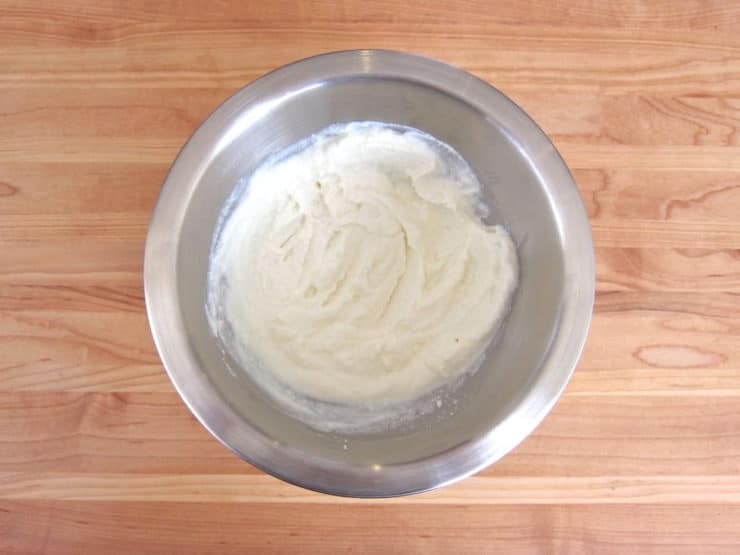 In a small bowl, stir together the ricotta, milk, sugar and almond extract. If not using the amaretto, proceed with the recipe. If using the amaretto, pour 2-4 tbsp over the cherries and stir to coat (use as much as you like according to taste). 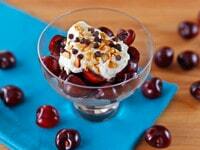 Divide the cherries between 4 small dessert dishes. 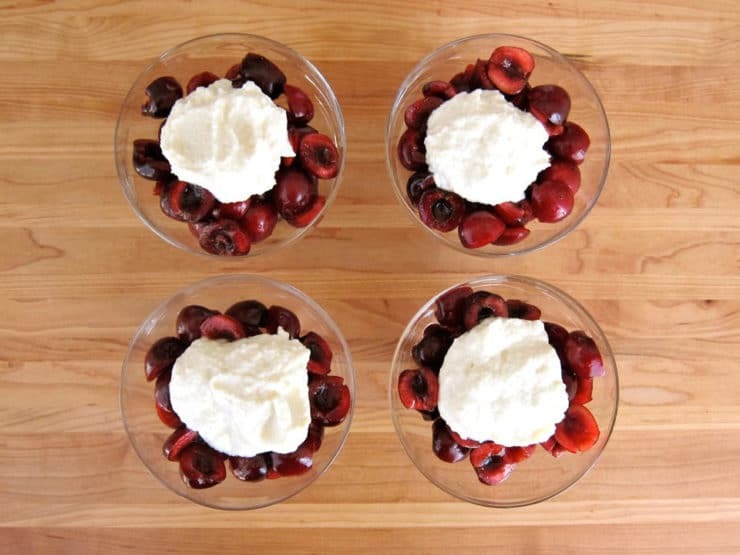 Spoon a portion of ricotta over the top of each cherry cup. Or, to keep it gluten free, sprinkle with sliced and crushed toasted almonds. 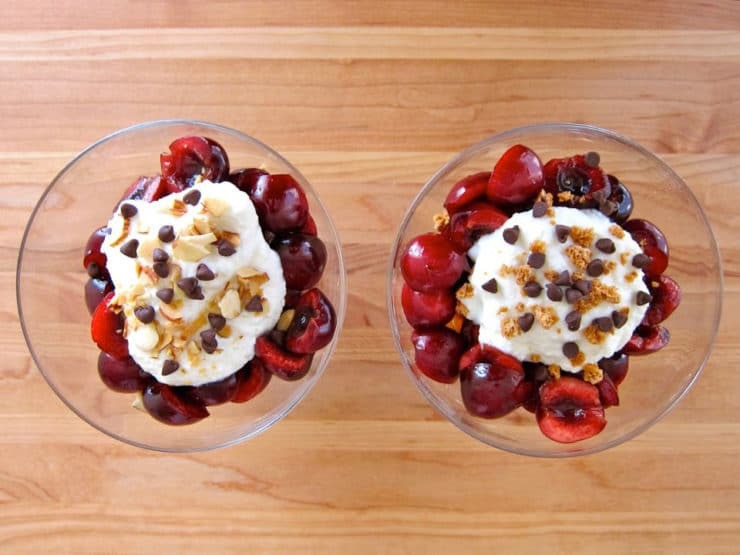 Top each bowl off with 1/2 tsp of cacao nibs or chocolate chips. Thank you, Tori, for sharing my book with your readers, and thanks to Natalya and the other kind commenters as well! Dessert? I just had this for breakfast. 🙂 Thank you for all this wonderful website, it became my favorite cook book for the last couple of months. Not only food is delicious, but writing is delightful as well. Sounds great! I’m collecting recipes to use for an NCJW event demo I’m doing on holiday desserts, and this sounds like a keeper. I’m going to only use recipes that happen to be gluten free, or are easy to make gluten free, and are very easy or do ahead. I’m hoping to use mostly pareve recipes. We have many members who need to accommodate special diets when they prepare holiday meals. It won’t share to my time line on Facebook. At my farmer’s market there is a guy who makes the most delicious ricotta cheese. I can’t help myself, I buy it almost every week. What a delectable way to enjoy this delectable ricotta. 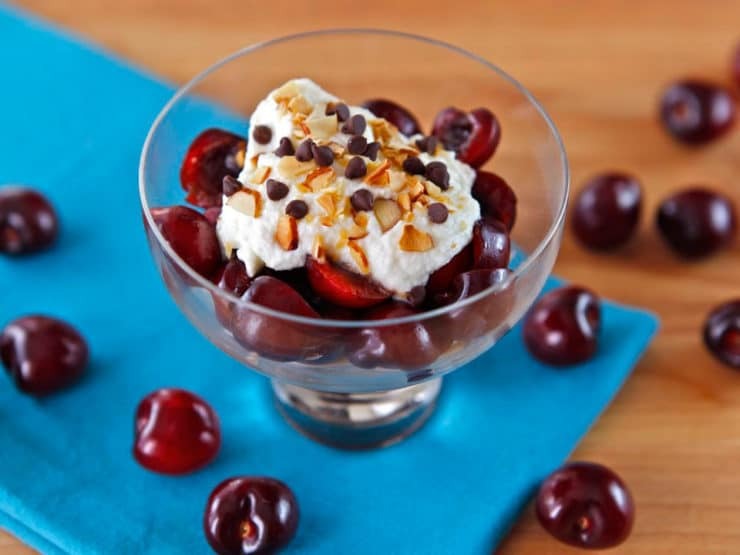 What a creamy and lovely dessert with cherries. Simple but so good! These sound absolutely splendid! Yum! 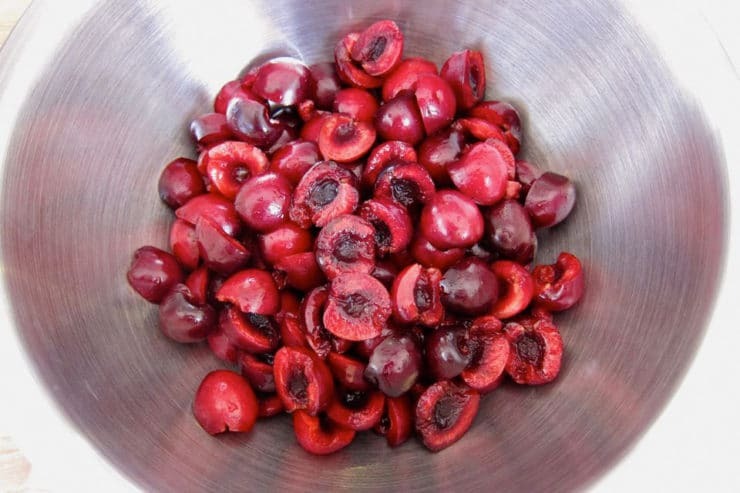 Now that speaks “summer”… I love cherries and eat them as snack everyday a big handful. I love this no fuss dessert approach. Thanks for introducing the book, I would have had no idea about it in this cookbook ocean. I can think of several people who would enjoy it as a gift.